For many, the term “rainbow baby” needs no explanation: it is, simply put, the promise of hope and joy fulfilled. It’s the unimaginable gift of having a healthy baby and pregnancy after the loss of a child–and though it is not something we hope anyone has to experience, it is a term everyone can understand. Rainbow babies are deemed as such because they come after the storm of loss: whether that is through miscarriage, stillbirth, or a child passing in the beginning of their lives. They are the embodiment of parent’s most fervent prayers and they represent the truest resiliency of the human spirit–after all, it takes an incredibly strong heart to persist through the kind of pain onset by the loss of a child. These special little ones are being honored in wonderful ways, especially lately: through open discussion and dialogue, rainbow baby-themed maternity photos, and tender onesies that proclaim to the world that the pain, though never permanently erased, is suddenly much less intense thanks to a tiny little person. 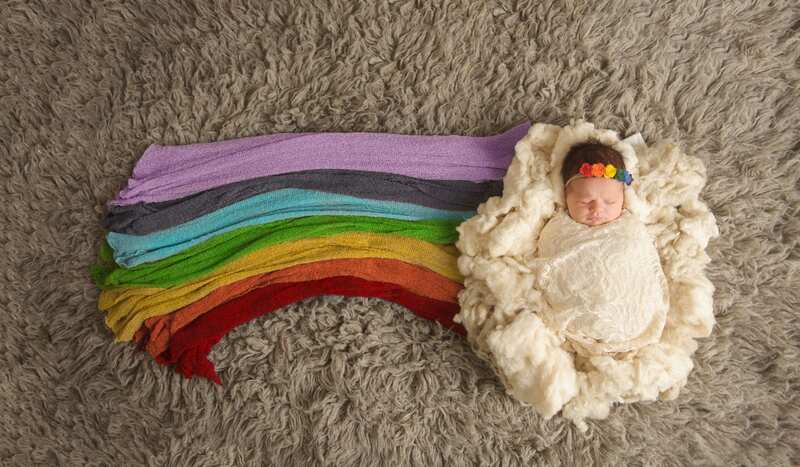 We asked pregnancy and parenting after loss mamas what the term “rainbow baby” meant to them. Many times, grief is aptly described as a storm because it represents a storm in so many ways. It can be sudden, terrifying, devastating, and tragic. Though some storms last longer than others, it’s also helpful to understand that storms do pass–after the turmoil, the dawn of day is upon you once more. The sun will rise, and with it comes an optimism that encourages you to persist and to clear the wreckage, making way for what comes next. No one knows who coined the term “rainbow baby” for sure, though one thing is for certain: the fact that we are celebrating rainbow babies means we are discussing mothers and their experiences with loss, and in doing so we remember those who left the world far too soon. Rainbow babies are beautiful in the multifaceted way that the happiness and love they bring with them is also one that honors their siblings’ lives, however brief: and nothing could be lovelier or paint a clearer picture of the joy that follows the rain.